Click to Get a Bird Removal Quote Now! Birds are a common nuisance to humans as they can readily enter homes and buildings via very small entry points. They can build nests quite quickly and lay eggs, leaving the nest to forage for food to feed their young in the immediate area. 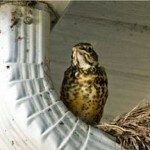 Most commonly, starlings create problems for homeowners. These birds were introduced to North America in the late 1800's and since then, have spread across the continent. Starlings feed on fruits, seeds and insects and are particularly active seeking food during spring breeding. Eggs commonly hatch within about a dozen days; with the young birds leaving the next at about three weeks old. Here in Halton Region and area, they are commonly proving a nuisance to homeowners as they enter dryer, exhaust or roof vents. Starlings in particular that roost in buildings can cause significant property damage. They and other birds can clog your home or buildings' drainpipes and gutters and litter your property with bird droppings. They can also try and take over bird feeders intended for smaller, more exotic bird species home owner's typically try to attract. Birds, depending on the type, can be extremely invasive and cause extensive damage once they penetrate your home or building. Also, they're noisy and pose a real nuisance problem. Our trained technicians are efficient at locating and addressing entry points where the birds have or may enter your home. Get rid of birds once and for all! We'll ensure they get out and remain out. We guarantee our work so treated areas are no longer breached. That means restoring comfort to home owners and their families!